@drsparkles thanks! It was a selfie I took for the bestie who bought the hair clip...to show her I was wearing it. I bought myself the Makeup Forever holiday palette as a Christmas present and I really like it. There are some 'out there' shades that I use for stage makeup, but some really nice neutrals for everyday. Lord jesus, I clicked on that link & now may have to buy it. 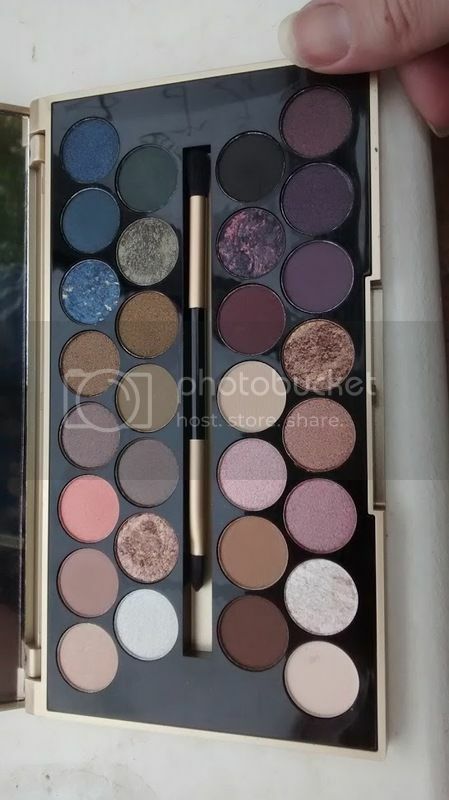 I'm planning to break my "I don't need palettes" policy for this one http://britishbeautyblogger.com/article/fortune-favours-the-brave-mur-palette/ - 30 pans and it's going to be £10 so how can I refuse? @foodycatAlicia That is a really great palette!! And for 10 pounds?! Yes, you are definitely going to need that one. I think I might need that! Those colors are GORGEOUS! That is a steal! Pigmentation looks pretty great and the color appear to be practical for every day and dressy looks! If I wasn't on a financial diet I'd have a friend buy me one and ship is state side. If you change your mind (and I can get it before it sells out!) I am happy to pop one in the post for you! I think MUR is stocked at Ulta, but I don't know how wide-spread those are. I've bought a couple of things from MUR and the quality is good, not just "good for the price". I just checked the website. It doesn't appear to have this particular palette but they do carry a fairly extensive bit of the MUR line. The large 32 shadow palattes retail for about $15 US which is a really good deal. I'm still going to behave. I just ordered a large storage trunk and plan to go through my stash and toss some of the old makeup. I really don't need to buy anything except 1 or 2 makeup brushes. It's been released a couple of days early, and I have placed my order so I will keep you posted! I haven't swatched yet, but it's really pretty! palette feels robust for a cheapy, thumb for scale (dainty little pans). That is a lot of gorgeous colors!! I'm going out for dinner tonight - I think I'll be wearing a lot more eye makeup than usual! A blue smoky eye is calling. Or not. Dinner has been cancelled due to both husbands (as in, mine and my friend's, they aren't both mine) being miserable buggers. Might just have to go and have a play with the colours anyway! HOW do beauty bloggers take good pictures of their own eye makeup?! I love my Tarte palette- it was a limited edition Holiday essentials palette that I got at my bridal shower, and it's amazing. Plus, the case is fabulous. Did anyone get their hands on the limited edition Sweet Peach palette from Too Faced? I don't see it online at Ulta or Sephora anymore, so I wonder if it was really that limited edition. I keep telling myself it's not worth the hype, but I really like some of the colors that were in it. I didn't get access to the Peach palette but I did see on Instagram that other Too Faced palettes have dupes for all the colors in the Peach palette. Not sure if that's helpful or not. If you check out @angelamarytanner on instagram, she has photos showing dupes of each row of the Peach palette. I did get the Too Faced Peanut Butter Jelly palette and that's amazing! I went to get this today at Ulta and it is sold out (and sold out online, dammit). Do you looooove it? @merciblahblah I do love it! Maybe it's available online from Ulta? The "jelly" shade is an interesting pink/purple. You do need to wear a purple based primer underneath so more of the purple shows up. At least on my skintone, which I think is NC35 or NC37, the purple leans too pink without a more purple primer underneath. The "banana" gold shade is the perfect gold for me. It smells really good too. Sorry! I have probably increased your lust for this even more. Did anyone see Urban Decay's new Alice in Wonderland palette? I don't think I'll buy it but it is beautiful. I can't figure out how to paste a picture. @merciblahblah Oh oops, I just saw that you did look online too. I'm sure you know this but at least on Ulta's site you can check by store to see if a palette is available. Most of the Ulta's in the DC area though aren't that near each other. I wish there were more Ulta's like there are Sephoras. @lipstickdiva I saw the Alice palette and thought it was gorgeous as well. I just never know how to use those jewel tones, so I'll probably pass on it. @TravelingDesign It is beautiful to look at but I just can't bring myself to spend the money on it. I wonder how many of those shades are dupeable. In general with jewel toned shades, I like to wear them on the outer corner of my eye if they are darker. If they are a lighter color I wear them across the eyelid with a transition shade. Maybe I'll just go stare at it in Sephora and then walk away.... with something else. Oooooh, @foodycatAlicia I want that too! So pretty. I bought a very cheap mulit-colored eyeshadow palette over the weekend that has the jewel tones I don't know how to use. I figured I could at least attempt them and hopefully not look like someone punched me in the eye. I'm sure you wont look like you got punched in the face!